Vajrasati Yoga School school is accredited as a '500 Plus teacher training program' by an internationally respected Yoga Alliance Professionals. This is great news for all teachers and trainees of the school, because although we all knew what we were doing was conscientious, focused and committed practice and study and that our teacher training course is nothing if not thorough, it still makes a big difference to have this recognition. 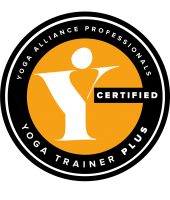 After several years with the Yoga Alliance USA Vajrasati Yoga has moved its accreditation to The Yoga Alliance UK. After several years with them we are now accredited to this new higher level with only 6 other schools in the whole UK. It is a real mark of recognition that the teacher training you are joining is the of the highest standard. Click here to see Jim Tarran's page on their website. Click here to see the Vajrasati school on their website.